I waited for a few days for this tribute post on the destruction of a part of Notre Dame (the building’s spire and most of its roof had collapsed, and its upper walls had been severely damaged; extensive damage to the interior was prevented by its stone vaulted ceiling, which largely contained the burning roof as it collapsed). As a European I grieve for this misfortune but I’m also so optimistic about its instauration: Tomorrow, I am sure that the Day of Resurrection of our Lord Jesus Christ (according to the Catholic calendar – I happen to be an Orthodox) will also mark the start of the resurrection and total remedy of Notre Dame. 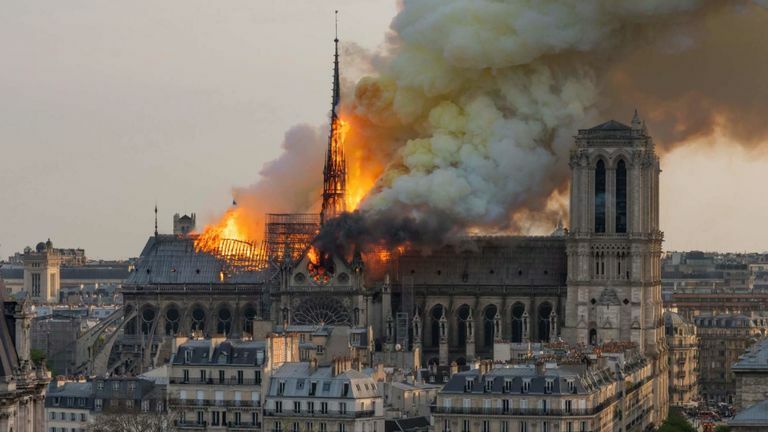 Taking into account the aspect of engineering, the damages are definitely repairable and that is the fortunate element in this misfortune for France and the EU. One of the most enduring and widely debated questions in prehistoric archaeology concerns the origins of Europe’s earliest farmers: Were they the descendants of local hunter-gatherers, or did they migrate from southwestern Asia, where farming began? We recover genome-wide DNA sequences from early farmers on both the European and Asian sides of the Aegean to reveal an unbroken chain of ancestry leading from central and southwestern Europe back to Greece and northwestern Anatolia. Our study provides the coup de grâce to the notion that farming spread into and across Europe via the dissemination of ideas but without, or with only a limited, migration of people. We review studies of genomic data obtained by sequencing hominin fossils with particular emphasis on the unique information that ancient DNA (aDNA) can provide about the demographic history of humans and our closest relatives. We concentrate on nuclear genomic sequences that have been published in the past few years. In many cases, particularly in the Arctic, the Americas, and Europe, aDNA has revealed historical demographic patterns in a way that could not be resolved by analyzing present-day genomes alone. (A) Pre-LGM dispersal of non-African populations, carrying both M and N lineages (hgs R, U, U5, and U2′3′4′7′8′9 belong to the N clade, distinct from the M clade). (B) Post-LGM re-expansion in Europe while ice sheets retracted. (C) Late Glacial shift in mtDNA hg frequency. (D) Holocene hunter-gatherer mtDNA, mainly belonging to hg U5. How modern humans dispersed into Eurasia and Australasia, including the number of separate expansions and their timings, is highly debated [1, 2]. Two categories of models are proposed for the dispersal of non-Africans: (1) single dispersal, i.e., a single major diffusion of modern humans across Eurasia and Australasia [3, 4, 5]; and (2) multiple dispersal, i.e., additional earlier population expansions that may have contributed to the genetic diversity of some present-day humans outside of Africa [6, 7, 8, 9]. Many variants of these models focus largely on Asia and Australasia, neglecting human dispersal into Europe, thus explaining only a subset of the entire colonization process outside of Africa [3, 4, 5, 8, 9]. Characterizing genetic diversity in Africa is a crucial step for most analyses reconstructing the evolutionary history of anatomically modern humans. However, historic migrations from Eurasia into Africa have affected many contemporary populations, confounding inferences. Here, we present a 12.5x coverage ancient genome of an Ethiopian male (‘Mota’) who lived approximately 4,500 years ago. We use this genome to demonstrate that the Eurasian backflow into Africa came from a population closely related to Early Neolithic farmers, who had colonized Europe 4,000 years earlier. Figure 1 : Genetic structure of ancient Europe. We extend the scope of European palaeogenomics by sequencing the genomes of Late Upper Palaeolithic (13,300 years old, 1.4-fold coverage) and Mesolithic (9,700 years old, 15.4-fold) males from western Georgia in the Caucasus and a Late Upper Palaeolithic (13,700 years old, 9.5-fold) male from Switzerland. While we detect Late Palaeolithic–Mesolithic genomic continuity in both regions, we find that Caucasus hunter-gatherers (CHG) belong to a distinct ancient clade that split from western hunter-gatherers ∼45 kya, shortly after the expansion of anatomically modern humans into Europe and from the ancestors of Neolithic farmers ∼25 kya, around the Last Glacial Maximum. 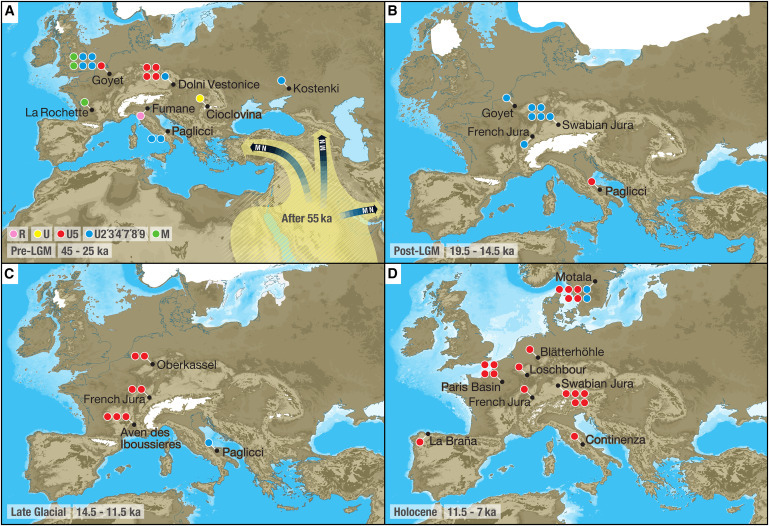 CHG genomes significantly contributed to the Yamnaya steppe herders who migrated into Europe ∼3,000 BC, supporting a formative Caucasus influence on this important Early Bronze age culture. CHG left their imprint on modern populations from the Caucasus and also central and south Asia possibly marking the arrival of Indo-Aryan languages.